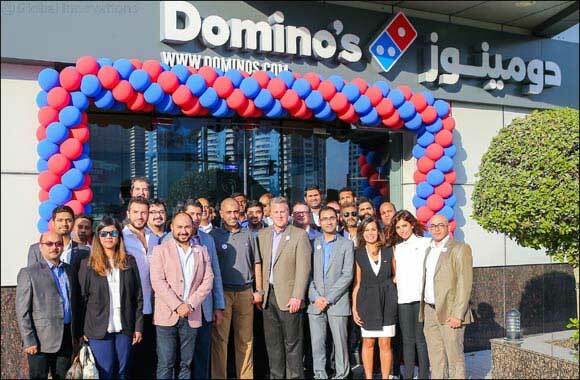 Dubai, UAE - March 29, 2018: Domino's Pizza, the No.1 pizza chain in the world, has recently opened its flagship store in Dubai Marina. The new store, located in a high visibility area buzzing with residents and tourists, is expected to cater to the demands of great tasting, high quality Pizzas in and around the Dubai Marina area. The fresh new look of the store is part of Domino's Pizza's efforts to refresh its image and reach out to a larger base of pizza lovers. The store is in close proximity to Dubai Marina metro station and has an outdoor seating. Domino's Pizza is well known for its freshness and quality of the Pizza, in addition to offering best value. The flagship store features a refreshing design concept in the region, along with a unique theatre concept design to give customers a candid view of their orders being prepared. Every aspect of the store, including the interiors and colors is in line with a vibrant theme, complementing customers' taste and preference. Well known for serving a wide range of supreme quality delicious pizzas, breads and chicken delights, Domino's Pizza is certain to grow much faster by carving its place in the hearts of pizza lovers across the UAE.